The golden rain tree (Koelreuteria paniculata) is named for the carpet of yellow petals that flitter to the ground around it in summer, creating a magical effect that lasts for several weeks. 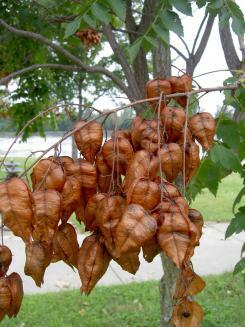 It is also a tough and adaptable specimen that matures quickly into a small shade tree. leaves. The tiny yellow flowers emerge in early summer in elongated clusters from the tips of the branches and then begin to rain by mid-summer. Golden rain tree also has golden yellow foliage in fall and unusual seedpods that hang on the bare branches well into winter, resembling tiny Chinese lanterns. Spring is the optimal time to plant a golden rain tree. Look for trees that have a straight trunk and well-spaced branching pattern in the nursery, as these are more likely to develop a pleasing shape later on. Staking the tree with a stout wooden post on either side is important to keep it from toppling over in high winds before the root system is established. The beauty of the golden rain tree is the minimal care it requires. Water weekly for the first couple of years and maintain a weed free area around the trunk, ideally covered with mulch. They don't always take on a picture perfect shape on their own, so selective pruning may be in order. Remove branches that have either a very wide or very narrow angle with the trunk and thin out smaller branches as needed to maintain an open crown with an even distribution of foliage. Any deadwood that appears in the canopy should be removed. 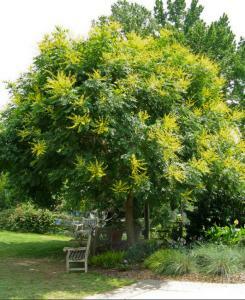 Pests and disease generally aren't an issue with the golden rain tree. However, in certain parts of the country it has a tendency to spread itself by seed, popping up all over the landscape where it is not desired. It can even spread into natural areas and displace native species - this is particularly problematic in the Deep South and other warm climates. If you find golden rain seedlings growing where you don't want them, there are two primary options for controlling them. One is to remove them by hand, roots and all. This is effective for scattered seedlings less than waist high, but gets difficult once the trees are much bigger or if there are hundreds to deal with. In this case, the best approach is to cut them to the ground, whether with a mower for tiny seedlings or a saw for more established ones. They sprout from their roots, so be prepared to chop them down again as soon as re-growth occurs, repeating the process until the root system is exhausted. Golden rain tree is known as a tough survivor. Its ability to handle smog and abuse make it a popular choice in harsh urban conditions, but its adaptability to any soil type and ability to thrive with minimal irrigation make it a worthwhile choice in almost any setting. They reach 30 to 40 feet tall and wide, big enough to make shade, but not so big that they overwhelm the garden and threaten to lift up pavement or drop branches on the house. Golden rain trees are the perfect size for small front yards and provide visual interest through all four seasons. Golden rain tree is not a species that has been bred into endless hybrids and named cultivars, but there are a few improved varieties worth considering. Fastigiata has a pronounced vertical growth habit. September is a variety that flowers late in the growing season. Stadher's Hill has ornamental red seed pods. Most flowering trees put on their show in spring, leaving the golden rain tree as one of the few showstoppers of mid-summer. When they do bloom, it's impossible to miss. If you're thinking of including one in your next landscape improvement project, you will be rewarded in just a few short years, as the golden rain tree grows several feet each season.